Good news for muzzleloader and rimfire shooters. SPG Lube is now available in a handy tin container, just right for lubing muzzle loading rifle patches. Also, rimfire shooters will find the new tin perfect for re-lubing the lube cannelures on .22 ammunition. 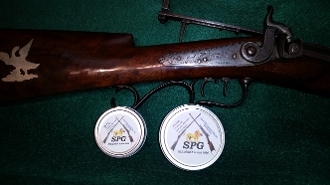 SPG lube works great when used on muzzle loading rifle patches. Simply place the dry patch on the lube and wipe a thin coat on one side of the patch. Place the lubed side out to contact the barrel, round ball on the dry side of the patch. The tin is the perfect size to fit in a hunting bag and keep your patch lube clean while in the field. Also, a cleaning patch with SPG Lube will prevent rust in your rifle’s bore without compromising accuracy. Many times .22 shooters will find that the lubricant has dried out on their favorite ammunition. Wiping a thin film of SPG lube on the bullet cannelures restores accuracy and prevents leading. Many competition shooters tell us that they prefer SPG Lubricant on their rimfire ammo as it works significantly better than the factory lubricant. The new tins provide for a convenient way to lube ammunition right at the shooting bench. These handy tins are a great way to carry SPG Lube in your shooting kit or hunting bag. Shipping Notice on MULTIPLE ITEMS: Your total shipping charges are based on the shipping method automatically calculated by size and weight, which can make multiple products show a higher shipping fee. Sometimes with multiple products we can ship for less than is quoted on the order form. SPG Sales will reimburse you the difference if we find any over-charge on the shipping and handling costs for your order. We are committed to providing the best possible service to our customers and value your business.